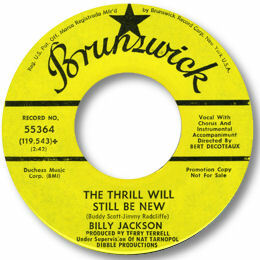 The original of this lovely deep soul piece covered in Southern Soul style by Howard Peters was performed by Philly artist Billy Jackson. Like Kenny Ballard, Jackson did some writing and some producing in the 60s and 70s (try the Tymes for example) but this beauty seems to have been his only 45 – his high baritone voice just may not have been distinctive enough. But he carries the infectious melody of The Thrill Will Still Be New well and the playing of the top session men in the Big Apple where this was cut – Pretty Purdie, Cornell Dupree et al – is as faultless as ever. You can find some of his best production work for Lifestyle here.